James O'Keefe was riding high last year when he released a series of videos showing employees of community-organizing group ACORN offering advice to O'Keefe and a friend that seemed to endorse trafficking in children, among other illegal activities. The undercover videos made O'Keefe a star in conservative circles and presumably helped him muster the courage for another high profile stunt – though this time, it seems, things went badly for the 25-year-old. O'Keefe allegedly filmed the men handling the main reception-area phone in the senator's office with a cell-phone camera. The faux-repairmen, who are believed to have been attempting to tap the phones, then asked for access to the telephone closet to work on the main telephone system; asked for identification after being directed there, they said they had left their credentials in their vehicle. The four men – O'Keefe, the two fake telephone repairman, and another alleged co-conspirator – are now "charged in a criminal complaint with entering federal property under false pretenses for the purpose of committing a felony, announced the United States Attorney's Office for the Eastern District of Louisiana." They could face up to ten years in prison and a fine of $250,000. The men had an initial appearance this afternoon in court, where they were released on a $10,000 UN-secured bond. A preliminary hearing has been set for February 12th, though that will be cancelled if an indictment is filed before then. Landrieu's office declined comment, citing the ongoing investigation. O'Keefe, a former Rutgers University student, has a history of stunts that predates his ACORN hidden-camera work: According to the Star-Ledger, he "mounted a satirical campaign to ban Lucky Charms cereal from campus dining halls on the premise the breakfast fare was offensive to Irish-Americans" as a student. He told the newspaper the tone of his videos, which include an investigation of Planned Parenthood, is unique. 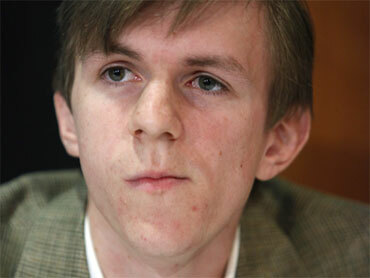 "I'm not just reporting on something, I'm becoming something I'm reporting on," said O'Keefe.